This entry was posted in interesting people, rifle and tagged 308Win, coonan, Danica, FAL, girl, pretty, semi-auto. Bookmark the permalink. 7 Responses to Danica smiles. Again. I LIKE that gun! Is it yours? More details? She’s one of my favorites…top 3 of the models you shoot with Oleg. 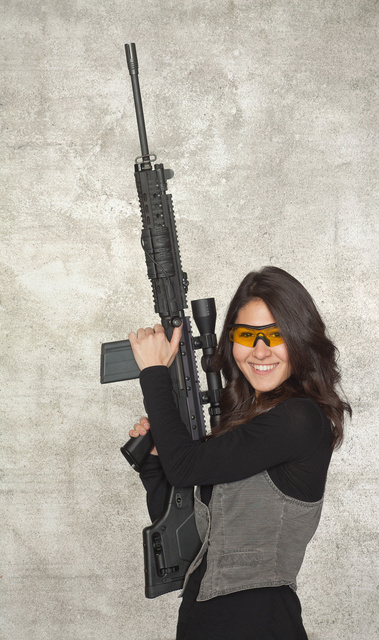 Knowing the length and proportions of a full-sized FAL, I’m guessing Danica is all of five nothing at the most. 5’2″ — she could run an RFB just fine but this rifle has too long of a stock.